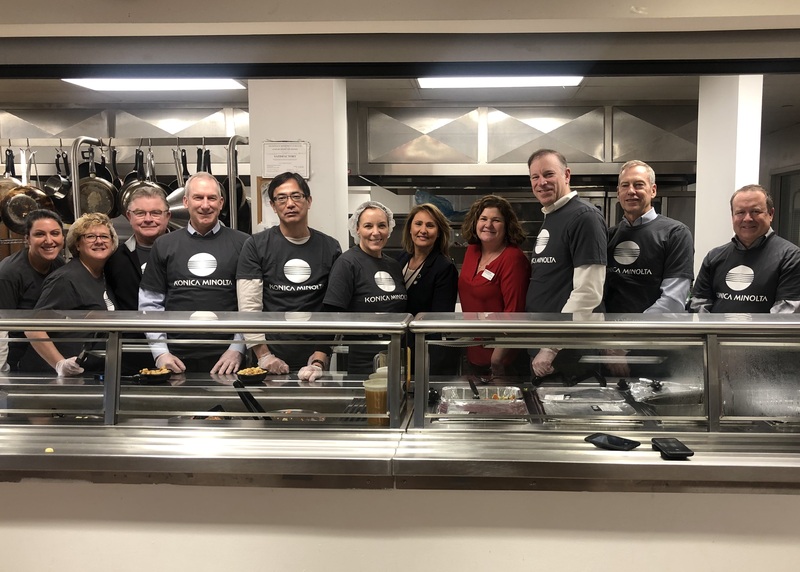 Konica Minolta Executive Team Serves Lunch To Those In Need | Industry Analysts, Inc.
Ramsey, NJ – December 20, 2018 – This week, members of the executive team at Konica Minolta Business Solutions U.S.A., Inc., (Konica Minolta), spent an afternoon giving back to the New Jersey community. Through the Bergen Volunteer Center’s ‘All in A Day’s Work’ program, the team provided and served a three-course meal to those in need at The Bergen County Housing, Health and Human Services Center, an organization that aims to prevent and end homelessness in the state. As a company, Konica Minolta has long committed to being a positive force in the community, and creating new value for society on both a local and global scale. This year, Konica Minolta and its employees have participated in over one dozen volunteer initiatives and fundraisers, many organized with the assistance of the Bergen Volunteer Center. “As a global organization, Konica Minolta is committed to contributing to our society, and we know that positive change begins right in our community. We appreciate the Bergen Volunteer Center’s work and ability to connect us directly with local needs.” said Kay Du Fernandez, senior vice president, marketing at Konica Minolta. “The donation of time and efforts made by our Konica Minolta volunteers is bringing cheer to others this holiday season, which is the ultimate gift.” said Lynne Algrant, CEO Bergen Volunteer Center. In addition to volunteerism, Konica Minolta also supports many national non-profit organizations including the National Kidney Foundation, The Blue Angels Foundation and Books for Kids through various fundraisers and corporate contributions. Konica Minolta Business Solutions U.S.A., Inc. is reshaping and revolutionizing the Workplace of the Future™ (www.reshapework.com) with its expansive smart office product portfolio from IT Services (All Covered), ECM, Managed Print Services and industrial and commercial print solutions. Konica Minolta has been recognized as the #1 Brandfor Customer Loyalty in the MFP Office Copier Market by Brand Keys for 11 consecutive years, and is proud to be ranked on the Forbes 2017 America’s Best Employers list. The World Technology Awards recently named the company a finalist in the IT Software category. Konica Minolta, Inc. has been named to the Dow Jones Sustainability World Index for six consecutive years. It partners with its clients to give shape to ideas and work to bring value to our society. For more information, please visit: www.CountOnKonicaMinolta.com and follow Konica Minolta on Facebook, YouTube, and Twitter. This entry was posted in Konica Minolta and tagged executives, Konica Minolta, volunteer by andyslawetsky. Bookmark the permalink.